Todays post is brought to you courtesy of grUVywear, a UV protective swimwear company. Most of you know about my recent skin cancer scare and now more than ever, I'm being diligent about protecting my skin. That also stands true for my kids too. Did you know that 80% of skin damage occurs before we're even 18 years old? Yep, crazy, I know. That's why I'm excited to share grUVywear with you. Their swim shirts provide a UPF of 50+, blocking out 97.5% of the sun's harmful rays. 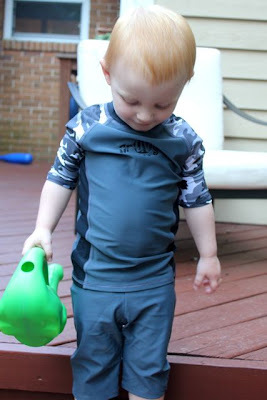 And if you have a little guy like mine who's allergic to many sunscreens or just hates to have it applied, grUVywear can be a lifesaver, literally! Jett loved his new "surfer" outfit so much that I had a hard time getting him to take it off. He just turned 2 in April and I ordered the XS 4 for him. It fits nicely with some room to grow but I imagine you want them to kinda fit snug so they don't get too baggy when wet. grUVywear also has a line of adult shirts and lots of color options for both the boys and the girls. Want a rhinestone decal? They have it. I can totally see my nieces loving that. UV hat or headband? They have those too. Hope y'all are enjoying the summer and staying cool! I received Jett's outfit from GrUVyWear in exchange for this post. All opinions expressed are my own. he is darling! i love that you have a ginger, we really do need the extra uv protection. :) have a great weekend amy!